When I graduated from ELON University in 1976, I had a hard time getting a US Visa. I had a position with M-W Delmore Studio, as a photography instructor training sales staff in proper photographic technique. M-W Delmore helped me apply for a Visa twice between May and August of 1976 with no luck. I missed the school picture season and got frustrated with all the government red tape. At this time, I decided to go to Randolph Community College to get an Associates Degree in Photofinishing. 1976-77 flew by for me, but it was a very intense year. I graduated RCC with a 3.99 GPA and by the spring of 1977, a job with Noritsu was waiting for me in Japan. While I was attending RCC, I came up with the "TODA PRINTER", which helped make accurate color print test strips, greatly reducing the waste of expensive color paper. In the 1980s through the 1990s, Randolph produced many great photographers and photofinishing technicians. It was one of the top schools in the country for the photographic arts and sciences. Rochester Institute of Technology was the only school that matched RCC’s level of training, and RIT’s program was 4 years compared to Randolph’s 2 year program! I strongly believe that Black & White darkroom processing should be done by hand, and by the photographer. Machines are great for color film. With color film, there is little to no room for creating or changing the developing process. You must follow what Kodak, Agfa and Fuji engineers say. Black and White film is exactly the opposite. There are hundreds of creative options that you have at your disposal to process true B&W film. It is only limited to your imagination. 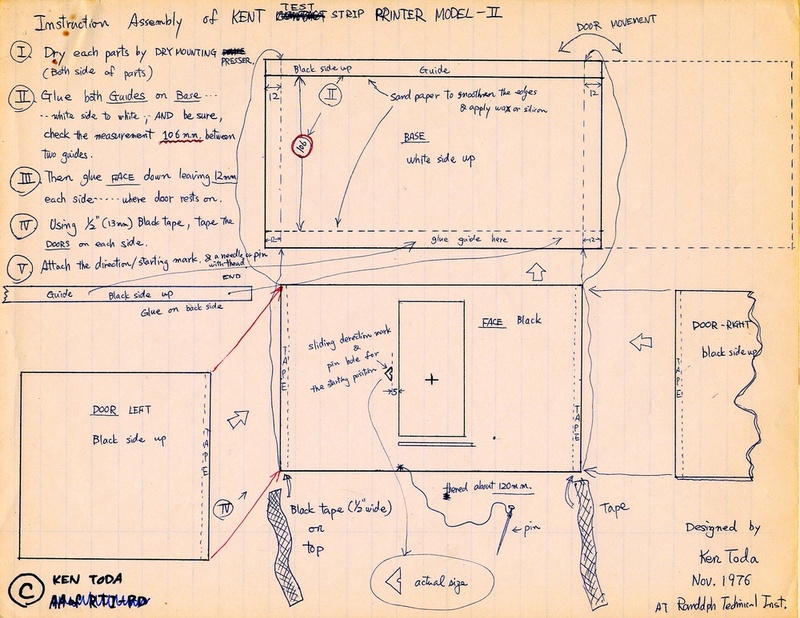 Original Blueprints For The "Toda Printer" from 1976.